When I chided him for seeding Detroit's all-galaxy receiver Calvin Johnson at No. 6 in the Madden cover contest, Anthony Stevenson didn't back down. "OK, who is it seeded above him that you would replace?" he asked. My answer? All of 'em. Megatron validated my faith in him, not as a sleeper pick, but the odds-on favorite to win out when he rolled into the final round of this contest with a crushing victory over the Green Bay Packers' Aaron Rodgers. And two months after offering up a field of 64 players—one of them a punter—for consideration, Madden has two candidates that recall the days when the league's No. 1 stud was a regular guest on the front of the game. Johnson, probably the best receiver in the league coming into his sixth year, will face Cam Newton, the Carolina Panther whose debut year rewrote expectations for rookie quarterbacks. As sure as someone wearing light blue and a silver helmet will make the front, Madden will be represented by one of the NFL's true up-and-comers and best players. "The cover vote represents a snapshot look at the NFL, ideally," Stevenson, the game's director of marketing, said to me this morning. "It's really fantastic, because when we look back at this time, we'll know, 'Wow, there were really some young, great players in this league. The Mannings and Tom Brady were around, but this is the time the next generation was coming in and dominating." The winner will be announced a week from today, April 25, on SportsNation, which broadcasts at 5 p.m. EDT. Madden has two candidates that recall the days when the league's stud held the front of the game. Stevenson thinks the final pairing is a total tossup, and insists he's not saying that just to remain neutral in a process he's overseen. "When you look at Calvin Johnson, the Lions are the new Saints, right?" he said. "Detroit is a feel-good city, they've been hit hard in the economy and they're coming back, the Lions, after going 0-16—and Calvin was a part of that—they get [Matt] Stafford and [Ndamukong] Suh and [Nick] Fairley, and now are what people feel like is a playoff or even Super Bowl contender. "I have no vested interest in either candidate, but who am I rooting for?" Stevenson pondered. "All things being equal, I'm rooting for Detroit. We saw this play out the same way in Cleveland a year ago." That's when the Browns' famously loyal fans got out the vote for the eventual Madden 12 cover star, running back Peyton Hillis, a kind of underdog, everyman representative from a losing team. He defeated Michael Vick in the final round, an unorthodox pairing of candidates that I'm not sure EA Sports would have considered in the days when its marketers alone chose the cover. Voters last year may not have really grasped what was being left up to them, too. Now, it feels like voters understand they're in charge of, as I have always called it, sports video gaming's Wheaties box. And with Cam Newton, they've given Stevenson another option who can sell a lot of product himself. "The advantage Cam has is he's the quarterback, and he won a national championship at Auburn, which has a huge fan base," Stevenson said. "Cam also won a lot of fantasy leagues for a lot of people who drafted him late or picked him up off waivers. But when you look back at the Madden cover, one position really stands out, and it's quarterback." It didn't help Aaron Rodgers, arguably the best quarterback in the tournament. But that's probably because, again, superstitious Packer fans didn't want their meal ticket breaking his collarbone in week 5 thanks to the mythological "Madden Curse," that befalls the stars—though it didn't for Drew Brees in 2010 or Larry Fitzgerald in 2009. "Calvin absolutely destroyed Rodgers in that matchup," Stevenson said. "Packer fans, you know, they live in a small town where it is all about their team, and they don't risk anything. It's no joke, [the cover curse] is a real issue for those guys. For the Lions and Panther fans, it doesn't seem to affect them as much. I think the voting will be pretty clean." For his part, Stevenson said he liked Arian Foster, the Houston Texans running back who, just like Johnson and Newton, is of that all-Pro mold, and top league story, that defined cover athletes like Vick in 2003, Shaun Alexander in 2007 and Vince Young 2008. Rob Gronkowski "from a sheer entertainment standpoint," also would have been a great representative, Stevenson said. The Patriots tight end filmed a bunch of comedy videos trying to rally support. But, yeah, you know, both of those guys lost to my guy: Megatron, whom I called, before the field was even announced, "a solid favorite to win it all." I just didn't think EA Sports had someone of his wattage lined up at the time. Give them their due, they did. "This whole conversation about Calvin Johnson being a six-seed, to me, it's not as fun if the final four was all No. 1 seeds, right?" Stevenson said. 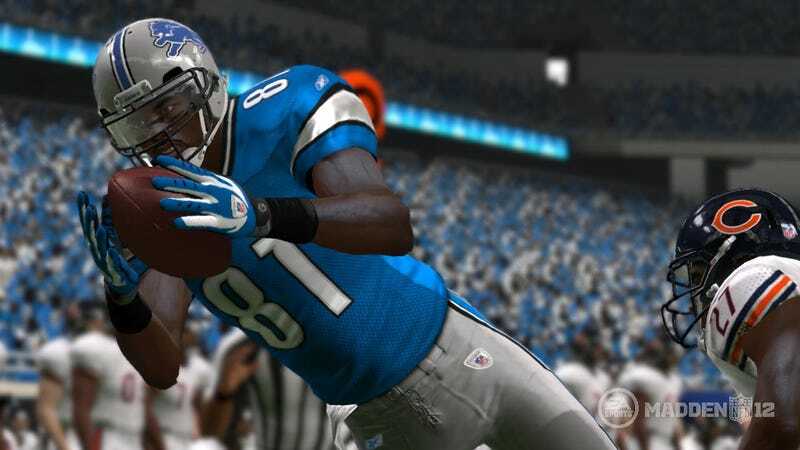 "It's all about the fans and whatever they want, and I love seeing Calvin Johnson get there. At the end of the day, you could make an argument for Arian vs. Calvin or Gronk vs. Calvin, and that's the point. It's about sparking conversation."